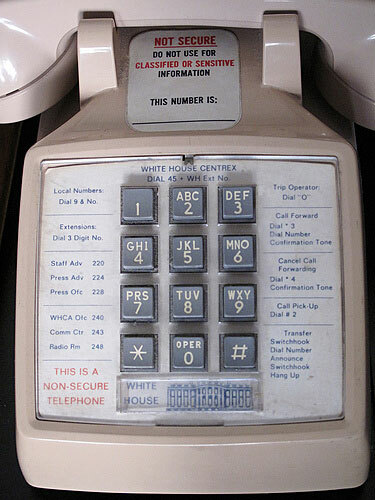 A White House staff phone from around 1990. 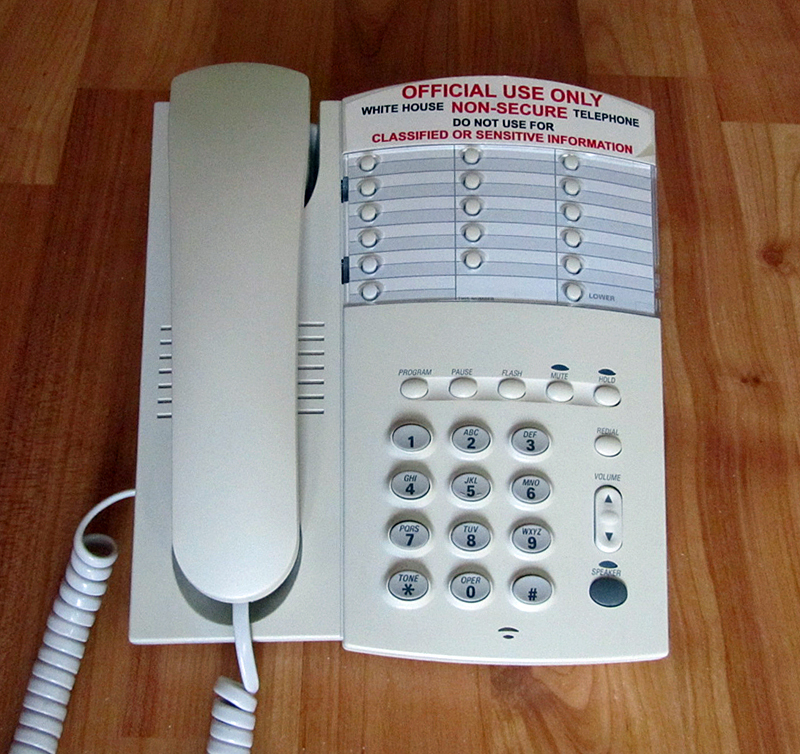 This is a quite common corded telephone from the 900-series of AT&T. It has standard buttons for program, pause, flash, mute, hold, redial, volume and speaker, and also 16 programmable buttons for two entries each. Red lights indicate when the mute, hold and speaker functions are enabled. Most distinctive is the big, customized sticker with the security warning "OFFICIAL USE ONLY - WHITE HOUSE NON-SECURE TELEPHONE - DO NOT USE FOR CLASSIFIED OR SENSITIVE INFORMATION"
A White House staff phone from the eighties. The phone in this picture is probably the same one as being displayed in the Icelandic Telecommunication Museum, and which seems to be left there by the presidential staff after the Reagan-Gorbatchev Reykjavík Summit in 1986. For a nice overview of all earlier phones used in the White House, check the website of Adam Forrest. As we can see there, the president had another telephone in the Oval Office: a Western Electric 18-button Call Director, a type of phone which dates back to the 1960's. The white AT&T phone in our first picture was probably used until 1996, when the White House got a completely new telephone system. This consisted of an automated private branch exchange (PBX) with black executive phone sets (models 8410 and 8520) from Lucent. Only by then, the old Western Electric at the president's desk was replaced by a high-end Lucent 8520 telephone. Except for a break of a few years, this phone is still there today. White House staff members nowadays also still use the Lucent/Avaya 8410 and 8250 phones. You have finished reading A White House staff phone and many articles about Tech Gallery in our blog this, please read it. and url link of this article is https://littlebitjohnny.blogspot.com/2013/01/a-white-house-staff-phone.html Hopefully discussion articles on provide more knowledge about the world of new tech gadgets.